When I was a kid, I associated buses with my brother Gus (the rhyming combo was always an easy pun). However, now that I’m in Mexico, buses carry a whole other sort of connotation. These hot and slow, rickety and leaking vehicles shout out symbols of religion, advertise demands for respect, and epitomize the way of life in Mexico. Welcome to Bucerias, Mexico. My name is Katie and I’ll be your transportation guide for today. So, first, let’s be clear: there are two kinds of buses. I call these vehicles minibus vans because 1) they resemble a van, but 2) are used as a public bus, and 3) are small in size. Hence, my original name for them: the mini bus van! In order to get onto one of these vans, you stand on the side of any road (there are smaller side roads hooked onto the big highways) and wave down the mini bus van that has the name of your destination on it. Fitting about 10 people per van, this little space gets hot. And I mean hot fast. It’s not unusual for drivers to pull over and chat with a companion on the side of the road for a few minutes while all the passengers inside are getting roasted by Mexico’s unforgiving sun and heat. On the other hand, it can also get windy, because sometimes people accidentally leave the sliding door on the side of the van open. Yes, I’m talking about the door via which everyone enters, and hypothetically through which everyone could fall out of as the van speeds down the road. Yes, mom, I am aware that this is dangerous. Usually though, some kind passenger reaches across the quickly moving van and swings the door shut with his or her might. Once safely in the van (with the sliding door shut, hopefully), you have to be aware of all of the people sitting around you. Since there are no official stops for most mini bus vans, people just yell out where they want to get off with “déjame aqui!” (leave me here), or “al siguiente!” (the next one!) or sometimes they’ve done this commute for a while and the driver performs telepathy and lets them off at their stop in magical silence. Since it’s so cramped and there are no buttons to press to get off, you have to be ready in an instant to jump out of your seat to let someone off. Some mini cardio exercise in the mini bus van! Once you’ve enjoyed the relaxing ride and peeled your sweaty legs off the seat to pay the driver, it only gets more entertaining from there. For instance, as some of the other Human Connections interns and I were getting off the bus to pay, the driver instructed us to pay 9 pesos for our trip. Just to let you know, that’s less than $0.90. So, aka sweet deal. Shawn and I paid first, then got off the bus. But, I was traveling with Kelly, who had taken this trip before and had only paid 7pesos the first time. So when she saw how much Shawn and I were being charged, she called the bus driver out on his scamming, and told him he was seriously overcharging us! Everyone in the group who paid after Kelly only paid 7 pesos. Lesson learned: speak up and use your Spanish if you think you’re getting ripped off! Now for the second kind of bus transportation: the big bus! I call them big buses since in contrast to the mini van bus, these buses can range anywhere from the size of an American school bus to the size of a traveling coach bus. The experience of traveling in a big bus is much more individualized than in the mini van bus. You get your own seat, there are buttons you press at your stop, and everyone pretty much minds their own business, sits back, and just teeters along with the bus. 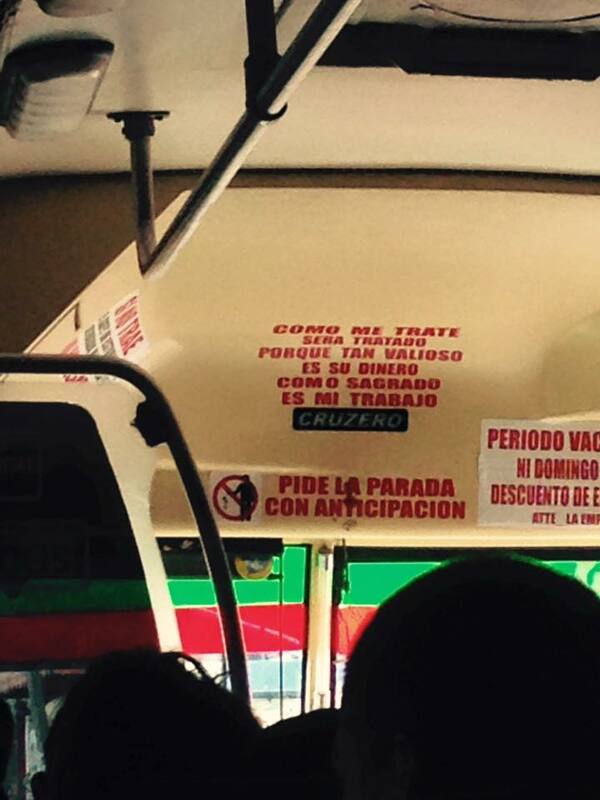 These aren’t just buses though, they are also places to advertise Mexico’s religious culture. 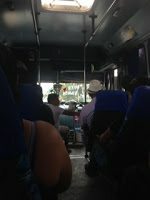 The first big bus I ever rode was from Bucerias, my small beach town, to Punta Mita, another beach town that attracts normal tourists and slightly more widely known tourists like Bill Gates (casual, I know). While the bus seemed plain on the outside, it was another world on the inside, like we had walked into a mobile Catholic church. The Virgin Mary watched over us as we held onto the poles and stood for the first twenty minutes of the ride on the completely packed vehicle. The phrase typed below her “Ilumina Mi Camino,” translated as “Illuminate my Path,” sent out a feeling of comfort. It seemed unusual to have such a revered figure in such an ordinary, if not beaten down, setting. But then again, perhaps those are the settings in which people look most to religion to support them if they choose that system of support. Familiar with Mexico’s large Catholic population, I can imagine for many passengers it is calming to have a symbol of religion accompany you on your daily journey. The Virgin Mary wasn’t the only obvious religious symbol: a small Jesus on a crucifix was attached to the windshield! Red and green mini piñatas framed the travel size emblem of Christianity, making me wonder if it had been there since Christmas time this year or was posted over a whole decade ago. Coming from a country that has its fair share of conflict between religion and secularism, the openness and bluntness of Christianity in Mexico struck me powerfully. Even though I’m Jewish, I didn’t feel pushed away by the Virgin Mary or the travel size Jesus on a crucifix. It is so clearly something that is embedded into Mexican culture, I could not feel judged or constricted by it. I didn’t judge them either, I merely observed and reflected. While these buses may seem to fly down the street with no consideration to safety or rules or schedules, the drivers do demand consideration for themselves. Cars back home may be convenient, but they limit interactions with the larger society. I recognize that I am not living with a local Mexican family, but instead am staying in an air-conditioned hotel room. I recognize that I’m eating my own personally bought food most days, and am not eating traditional food for all my meals. I recognize that I’m speaking English when I’m with my fellow interns, and not speaking entirely Spanish for half the day. For all these reasons, I am glad that I can interact with the true traits of Mexico, even if they do involve hanging out a sliding bus door. How Will I Leave My Mark in Mexico?